Nobody wants to have to deal with a raw sewage backup, especially in the home where the saturation is completely indiscriminate. The smell permeates everything and activates the gag reflex, but that is not as toxic as what can happen to you or your kids if you are not careful in the midst of this most unpleasant disaster. Here’s a helpful Q&A to give you the 411 on your stinky situation. Simply put, raw sewage is wastewater. What’s the big deal? Most people are at least aware that there are two separate drain lines in their house – one for waste and the other for everything else. These two lines are not supposed to know each other, and woe to home whose pipes experience so much pressure that sewage begins to backup. Call a water damage company that can safely handle sewage backups at the first sign, or smell, or trouble. The one time I experienced a raw sewage backup, it was in an apartment complex that had a lot of trees where the grounds were set at different levels. The view out my bedroom made it seem like a sunk-in room because the sidewalk and the lawn beyond was above my patio. The mature tree roots were strangling the underground pipelines because the roots are like devious little children trying to steal the water. Anyway, the pipes were busted underground and caused a pretty nasty backup. More commonly, sewage backups are caused by clogs in your pipes. Flushing inappropriate material, or too much appropriate material for that matter, can have grave consequences. Heavy rains causing rainwater runoff, industrial-site drainage, washing water, discharge from sewage treatment plants, watersheds, septic systems or any internal plumbing problem can be responsible for raw sewage backups. Flooding poses a wide-spread health problem when all the people caught in the flood zone are submerged in water contaminated by large amounts of wastewater. The risk of cholera is typically high. Those on the coast are familiar with beach closings due to run-off contamination. These are pathogens that can contaminate entire ecological systems beyond sickening people and their pets. Symptoms of illness may include nausea, vomiting, diarrhea, stomach cramps, abdominal pain, fever or yellow skin. A raw sewage backup is not the kind of mess you get shovels and trash bags to scoop up. 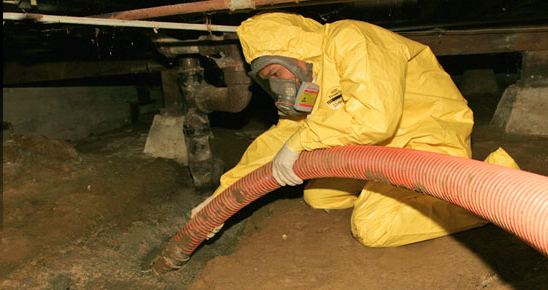 You need a qualified sewage backup cleanup company that can safely clean, disinfect and make sure everything is left safe and sanitized. Some municipal sewer systems are controlled by the town public works department or the water pollution control authority. The health department may have advice on disposing of sewage from septic systems. What are some more important raw sewage tips? Avoid flushing toilets, which can add to the problem. Keep the kids and house pets away from sewage. If you come into contact with sewage, make sure to thoroughly wash your hands immediately afterward and never touch raw sewage bare-handed. Accept that anything touched by sewage is contaminated and be prepared to throw out items that cannot be safely salvaged. Avoid touching your hands to your face, nose, mouth, ears or eyes if you have not washed first. Launder items separately to those that have not been exposed. Contact a doctor as soon as possible should symptoms occur. If cleanup is delayed for any reason, consider temporary alternative living arrangements until it is safe to return. There you have it. Here’s hoping you never have to cope with a raw sewage backup, but if you do, at least now you know how to respond.